McKinney88 wrote: I have a question on this topic. I am bout to start several different kinds of plants and I was thinking that at the first sight of any sprout I would transfer the starter outside to put them in the sun. We have temperatures on average of 70-75F right now I think it would be warm enough for it. I already have many other things in the ground from seed but its rainy season and chances of getting a good dry time to till and plant more may not happen for a couple weeks. I was hoping to avoid the whole process of starting them indoors and letting them get big then having to harden them before planting them in the ground. IF the tempereature outside is 70-75 why not just start them outside where they are going? I always try to start my plants outdoors in the exact spot they will be growing if possible. I realize this isn't always possible, but if you are having such nice weather in the outdoors I would really consider just starting the plant out there and letting it grow where it will be to avoid putting more stress on the plant than necessary. I was getting a ton of rain so i decided to start them indoors. I also have a problem with my little sprouts being eaten. I start most of my seeds uncovered. Especially if they are small seeds like basil. I sow pepper seeds on top and just barely cover them. I grow them outside when the night temperatures are in the 70's. Otherwise a heat mat really helps. Peppers do not germinate well until it is warm. Cilantro seeds can be soaked first overnight before planting them and they crack faster. I don't have to do that anymore, but they cannot be allowed to dry out. Seeds need to be kept evenly moist without being too wet or the seeds will rot. The planting media needs to drain well. If water puddles on top or the soil starts turning green, the media is too dense. Some seeds need to be stratified first. Morning glory germinates better if it is nicked with a file first. To save space, I often start seeds in 4 inch community pots and transplant them out after they have true leaves. Seedlings need to keep growing. Seedlings need to be potted up or planted out before they become root bound. Make sure if you are planting out to the ground that you have enough space for the plants to grow. Seedlings when they are first planted out look sparse, but you need to keep the mature plant size in mind. A little more room is even better. To keep seedlings healthy, start fertilizing seedlings with a liquid fertilizer when they are two weeks old. I put slow release fertilizer in my starter mix and that works too. Do not put fast release fertilizer in starter mix or the seeds may fail to germinate. Keep seeds fresh in the refrigerator or freezer and take out only what you need. If you are keeping seeds for more than one year, do a float test to see if the seeds are still good. Seeds that sink are good, floaters should be discarded. Some seeds like corn do not keep for long, others like beans and dill can be good for 10 years or more if they are kept cool and dry. Germination percentage drops the longer you keep the seeds so you may need to plant more seeds than normal if you are using older seeds. Some seeds like stevia and ghost peppers have a naturally low germination rate, so more seeds are needed. Many plants will not come true from seed, this is especially true of hybrids, but there is also variation between seeds in a batch. Stevia may vary in sweetness, peppers may vary in heat, if you want the exact same qualities of the plant, then cloning by cuttings will be more reliable than seeds. If you are saving seeds, make sure the seeds are mature and thoroughly dried before storing. Label date collected and what kind of seeds they are. They are best stored in an air-tight container in the dark. I use zip locks. Some seeds like tomato and papaya are coated so they need to be fermented first before drying. Great thread! Thank you for all the tips, I found out some things I was doing wrong and right. 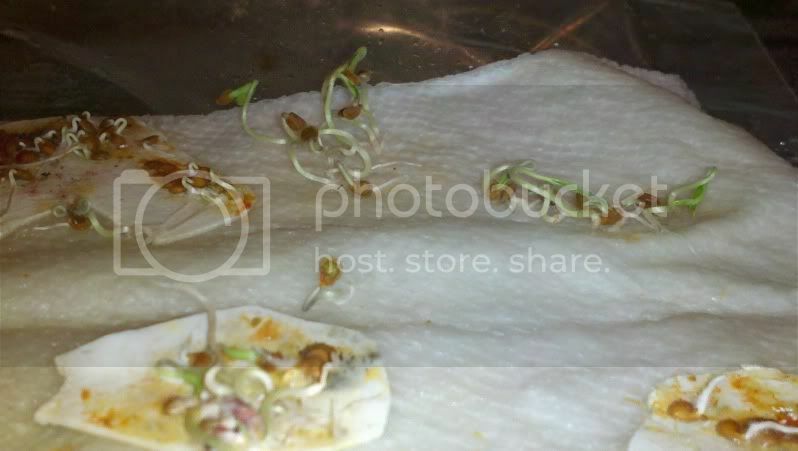 I cheat just a bit with mine I put my seeds in a wet paper towel and then put them in a plastic zip lock. These are only a few days old and I am getting ready to pot them. I get 2 things from doing this 1 I save time and 2 I don't waste a pot on a bad seed. I think I'm going to try that next year ohio tiller. That looks like a good method. Do you always let the germinated seeds sprout to that extent? It's usually better to sow the seeds as soon as they have germinated -- that means when the tips of the root radical shows. In tiny seeds, they should look like white dots and tomatoes no more than 1/4". They are sown at their normal depth. When they are nearly ready to sprout out of the seed husks I find it harder to judge how deep to sow/plant them. How did you plant those? Very useful info. I didn't think to avoid peat pots. I always tend to over water, think more water was better. But obviously it wasn't always the case. I was doing more harm from over water by causing rot. A rule of thumb is to plan seeds that are tiny on the surface and larger seeds about 1-1/2 times their diameter deep. I do not have luck with small cells. Cell trays take up a lot of space so I use community pots for seed starting. That way I can grow a variety of plants in minimal space. I mostly use 4 or six inch pots but sometimes I will start seeds in flats. The pots need to be clean and filled with sterile media. You can use potting soil, but I prefer to mix 50/50 peatmoss and perlite. I will plant multiple seeds in the pots or the flats and after they have germinated and gotten their true leaves, then I will transplant them into individual pots or to the ground. This method works fine for most plants that transplant easily. I have also used community pots for dill and beets. Beets usually transplant fine. Dill, fennel and other plants with delicate roots need to be transplanted carefully. I will usually plant more of them since I do not expect all of them to survive. Flats sometimes work out better for the more delicate plants since I can spread the seed out more and cut out blocks when it is time to transplant. For some seeds that can be fussy to germinate like parsley and coriander, soaking seeds in warm water overnight helps. Morning glory and hard seeds may need to be scarified first. For harder to germinate seeds. I will soak and scatter the seeds on the surface of the media and cover with a light sprinkling of potting mix. To keep tiny seeds in place, I cover the seeds with a piece of paper towel and water through the paper towel. Keep the paper towel from drying out. After about 7-10 days check to see if the seeds have germinated. When most of the seedlings have germinated, gently remove the towel and bottom water until the seedlings are large enough to be top watered. Some seeds need light to germinate and others need to be cold stratified first. 6 weeks before planting garlic, I keep my bulbs in the refrigerator crisper in a paper bag. Inoculate legume seeds for better nitrogen fixing nodules. Most garden beans, peas and soy use the cowpea inoculant. Keep seeds cool, dark and dry. Store seeds in the refrigerator or freezer. Paper envelopes inside a ziploc bag works. Put in one of the dehydrating gel packs, rice or crackers in the bag to absorb any errant moisture. Take out only the seeds you need. If you have bulk packs, divide them into smaller packs before storage making sure you label them with name and date. Seeds do not like drastic temperature changes, if you take out a big bag of seeds from the refrigerator or freezer and leave them out for an hour moisture can condense and spoil the seed. When saving seed, make sure, the seeds you collect are ripe, remove all the debris. Dry seeds out to make sure they do not have any excess moisture. Pick through the seeds and get rid of the bad ones. Put seeds in a paper bag or envelope and note date collected and name of the seeds and store the seeds in the refrigerator or freezer. Note, seeds will lose viability over time. Test seeds, for germination rate. Many seeds can last 5 years, others are only good for three. Beans and dill are good for over 10 years. Wow I'm so happy I came accross this thread! I decided to start some of my seedlings indoors this year, but grow lights can be so expensive! I was thinking it was not possible to start seedlings on a budget. I think I will try Garden Gnome's set up (1st page) with the walmart lights and heat mats. I think that should be good enough for a small scale home garden. Thank you! Check out my garden blog and website! Yup, all you need is regular shop light fixtures with standard fluorescent tubes/ bulbs. I start maybe 500 plants a year from seed that way. Yeah the flouresent tubes are the way to go. LED work great but generally they are too expensive for the lower energy cost to matter any time soon. Cheap 6500k flourescent bulbs works like a charm for me, i have even grown and harvested chili grown with no other light. Great thread! I read through the whole thing today. I'm using 3 Walmart fluorescent fixtures with T8 daylight tubes and I have a heating mat large enough for one 10 X 20 tray. Herbs are doing great. Now it's pepper & tomato time!! Hey again, so I'm trying to start my seeds on a budget, and I looked for some of the lights mentioned on here, but I don't have any shoplight fixtures or anywhere to put them if I did, so I bought this lightbulb and was just planning on putting it into a lamp. Do you think it would work for starting seedlings until they can go outside? Or any other suggestions? Also, if I got heat mats, do you think it would be possible for the seedlings to germinate outside in the sun? Or would the air be too chilly for them still? I don't know what "this light bulb" means. What kind of light bulb? Is it fluorescent, like a CFL? Old style incandescent bulbs will NOT work. Give off too much heat; if you get it close enough to your plants to do any good, it will burn them up. But it depends on how many seedlings you are talking about. If we are talking about a fluorescent bulb, it needs to be right down close, just 2-3 inches above your plants. At that distance the area it covers is not very big. So you will not be illuminating very many plants. I use the 4' long fluorescent tubes in shop light fixtures. Running them cross ways four tubes cover four 10x20 trays of seedlings, but that means it is taking four tubes to cover each tray. If the tray is oriented along the length of the tube, it can be illuminated with two tubes, but then you can only do two trays.